Clara died in 1950 as indicated on her gravestone. There is a death record for a Clara H. Hall in Cook Couny, Illinois who died on 08 MAR 1950. However the middle initial is H. and without examining the primary record we cannot say for certain that this is the same Clara. Further verification is needed. 1 Daughters of the American Revolution Genealogical Research System, Ancestor #A000637 and A119002. 2 Federal Census, IL, Cook County, 1910, Chicago, Ward 13, ED #647, Sheet 1, Image 1 of 24, Ancestry.com (Online Census Images). 3 Federal Census, IL, Cook County, 1940, Chicago, Ward 48, Block 16, ED #103-3056, Sheet 2A, Image 3 of 24, Ancestry.com (Online Census Images). 4 Federal Census, IL, LaSalle County, 1880, Mendota, ED #74, Page 37, Image 37 of 48, Ancestry.com (Online Census Images). 5 Federal Census, IL, LaSalle County, 1900, Mendota, ED #65, Sheet 5B, Image 10 of 39, Ancestry.com (Online Census Images). 6 Find A Grave, (accessed 02/05/2013). 7 Illinois Statewide Marriage Index, 1763-1900, Marriage record for Emery Stanford Hall and Clara Louise Adams, Illinois State Archives. 8 Illinois, Deaths and Stillbirths Index, 1916-1947, Death record for husband Emery Stanford Hall, Ancestry.com (Online Database). 9 The National Cyclopaedia of American Biography, Volume 17, New York: James T. White and Company (1920), 9, Google Books (Digital Library). 10 U.S., Social Security Applications and Claims Index, 1936-2007, Claim record for daughter Josephine Hall Esterly, Ancestry.com (Online Database). 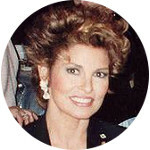 11 IMDb, "Biography for Raquel Welch", (accessed 02/05/2013). 12 Wikipedia, "Raquel Welch", (accessed 02/05/2013).